In this Stitches Build Guide, we provide an overview of his strengths, abilities, talents and matchups. Stitches is a versatile and frustrating Warrior to play against. His kit, though appearing simple, actually has a lot of flexibility and utility. Whether acting as main or off-tank, he's capable of making plays through his Hook that can single-handedly win games. Although he lacks direct immunity to abilities, or a means of mitigating damage entirely until later levels, he makes up for this in continued pressure from his Trait as well as high damage from his Slam. Unsurprisinly, Stitches is incredibly reliant on his Hook and I would stress the need to practice with it to ensure you reliably grab opposing players. Regularly missing your Hook is punishing, and leaves Stitches often having to wait on the sidelines until it's available again. In the right hands Stitches is very powerful and if he continually grabs the right Hero, he and his team can quickly snowball (especially in the current burst meta). Vile Cleaver (Trait) - Although Stitches Trait isn't amazing, its primary function is to simply add pressure to enemies that he hits. Causing poison damage to enemie increases pressure on the opposing Support. Ideally, you want to be infecting the enemy team with Vile Gas as often as humanly possible, though you shouldn't go out of your way - and risk your death - just to re-apply it. Hook (Q) - His signature ability and key to his play style, Hook has a moderate range and allows Stitches to pull one player towards him. Be aware however that if there is a minion or mercenary in front of your target, you'll Hook them instead. Fortunately, the projectile speed at which Stitches throws out his chain is fairly fast, so the margin for error only grows if your specific target has invulnerability or a teleport. Always try to target Heroes that have the fewest means of escape and preferrably the squishiest. Finally, Hook can pull players through scenary and will briefly stun anyone you strike, so even if you're at very close range and want to interrupt, say, E.T.C. 's Mosh Pit, you can. If possible, always try to find locations where your team has vision (but they can't see you) so they can you still Hook them. Slam (W) - A high damage, low cooldown, wide area attack that purely deals damage. Ideal for wave clear or pressuring a group of enemy players, you should use Slam as often as humanly possible as it's also incredibly cheap on mana. Try to hit as many players as possible. It's important to note that Slam slows and deals 40% increased damage to those in its inner radius, so it's important to be as close to foes as possible when using the ability. Devour (E) - Key to Stitches' survival is Devour. Dealing relatively high damage (half its maximum value against heroes) it restores roughly 20% of Stitches' health. It's a huge amount and will keep you alive 1 on 1, but also reduces the need for a healer on your team to constantly heal you. Try to always use Devour on the nearest target when low health, as it will gaurentee your survival and deal damage in the process. Finally, don't waste Devour just to top up a small amount of health - the cooldown is too long to waste. Putrid Bile (R) - The most popular Heroic ability , Putrid Bile tends to be a safe bet. Allowing Stitches to sprint quickly by gaining a 20% movement speed buff, he also emits a bile that slows enemies by 35%. If you can manage to squeeze around the enemy team to cover them in the Bile, your team can capitalize on this and focus them down. Best of all, Putrid Bile can also be used as an escape due to the trail of Bile following behind you (the speed boost also helps!). Gorge (R) - A heroic that's often overlooked but undoubtedly strong, Gorge allows Stitches to consume one player for 4 seconds. When Gorge ends, the player takes damage and during the period the consumed enemy can't do anything. Against an enemy tank, or healer, you can turn any fight from 5 v 5 to 4 v 5 instantly. Four seconds is a very lengthy period of time in Heroes of the Storm and if you use Gorge on the right target, there are few team fights you can't win. Ideally you want to Hook a high value target, instantly Gorge them and then walk away and into your team. Your team can then kill them with very little opportunity for the player caught to do anything about it. Stitches relies heavily on Devour for survivability and sustain, and while all 3 options at level 1 are viable, Savor the Flavor is arguably the most rounded choice. Upon hitting a Hero with Devour, it grants 8% of his maximum health and mana over time, for 4 seconds (effectively 2% per second). In addition, each use of Devour also increases his regeneration by 1. It's a considerable amount of healing, that ensures he can survive for much longer periods. Chop Chop allows Stitches to gain 50% increased attack speed after landing the inner impact area of Slam against a Hero. It's easy to maintain, ensures he can quickly apply his Trait, while also giving a brilliant lead into his level 7 Talent. Allowing Stitches to heal himself, per basic attack, for a total of 5% of his maximum health, Cannibalize is pretty amazing. Combined with Slam, it makes Stitches hard to bring down if he can repeatedly hit opponents. Not only does the mobility of Putrid Bile have value, but it's also amazing for allowing Stitches to plough through a team and surround a squishy Hero. The slow, combined with the damage ensures he can soften up multiple targets while still using his Hook/Slam. Lacerate infects enemies hit by Slam with Vile Gass, while also lowering armor by 10. Although Gas Flare offers similar damage (albeit higher after a Hook), the 10% armor reduction for the entire team is brilliant. 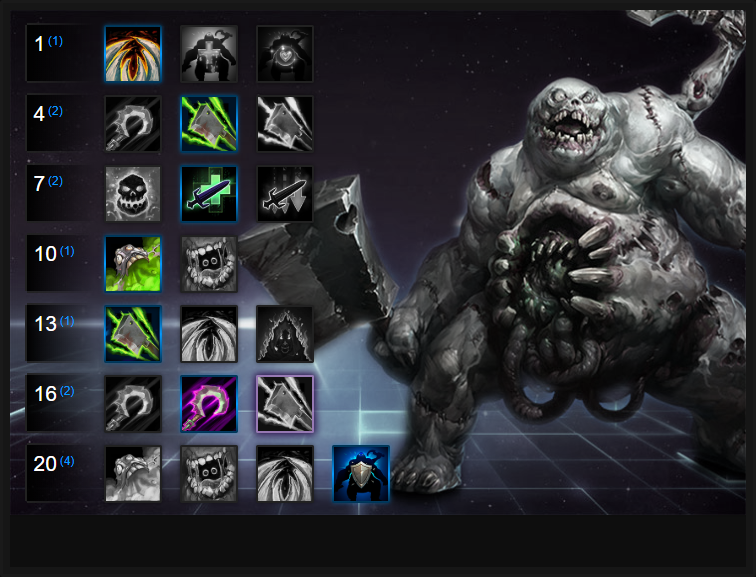 Purely for sustain, Meat Hook is pretty ridiculous. When Stitches successfully Hooks a Hero, he gains 16% of his maximum health over 4 seconds (4% per second). His basic attacks also increase this duration, allowing him to elongate his self-healing to ridiculous levels. If you also throw in Devour, he's so tough to bring down. Shambling Horror provides 50 armor for 4 seconds (what!) while also ensuring Stitches can't be slowed. Purely for the armor mitigation, it's absolutely amazing (especially if you consider his survivability through self healing). This list of tips and tricks are just a handful of things we think will help your Stitches play. We'll continue to add to the list as required and if you have any tips you'd like to share, let us know in the comments below and we'll place them here. 1. Stitches' Trait is completely passive and only triggers when he takes damage. Ideally, you want to be in amongst the enemy so that all those who hit you, suffer the damage over time (even if it is fairly low). 2. Slam is your only form of wave clear and AOE damage. It has a low cooldown (8 seconds) and is cheap on mana. Don't be afraid to use it often. 3. If you can, try to use Slam so that you hit an entire minion wave. Approaching it from the side (as opposed to head on) should allow you to do this fairly easily. 4. Devour is your primary form of sustain as it heals you for a considerable amount instantly. Unfortunately, it has a long cooldown: only use it when you have to and before your health is too low. 5. If possible, try to use Devour against a high value target. Its damage is halved against heroes, but it'll still eat a chunk of their health instantly. 6. Devour deals full damage against non-heroic units (including camps). 7. Your Hook can be blocked by minions and mercs. Try to always use your positioning to avoid them when attempting to grab someone in lane (approach from the top or bottom of a lane). 8. Your Hook has a fast traveling speed but you'll still need to lead your throw. Try to predict where you anticipate the enemy to be moving to, rather than where they currently are. 9. Hook can drag players through scenary. Try to do this as much as possible to truly pull someone out of position. 10. When you've Hooked someone and before you have Gorge, hit them instantly with Slam > Devour for maximum damage. 11. You can use Hook to stop someone from channeling an ability as it causes a brief stun. 12. Be sure to save your active abilities (Stone Skin and Hardened Shield) for when you're under serious pressure. Stone Skin provides a shield, Hardened Shield complete mitigation. 13. Always Gorge someone you have Hooked and begin to walk back into your team. It's also a good idea to ping for help at the location where you want to stop, so your team is ready.